The first fatality that took place in response to 9/11 was the shooting and murder of Balbir Singh Sodhi, an American Sikh who was mistaken for being an Arab by Frank Roque, who just wanted to “kill a Muslim” in revenge for the twin tower attacks. Sodhi wouldn’t be the last Sikh mistaken for being Muslim, and killed for it. Yesterday on August 5th a White Supremacist walked into the biggest Sikh temple a few miles outside of Milwaukee, Wisconsin and shot 6 Sikhs dead, and critically injuring 3 others. Wade Michael Page, 40, was an army veteran who was less than honorably discharged from the army for unclear reasons. He adorned a a 9/11 tattoo on his arm, and is believed to have intended to get revenge for the 9/11 terrorist attacks by attacking the temple. The treatment of the Sikh community after 9/11 is one of the greatest unknown stories in the United States. Sikhs were heavily targeted after the terrorist attack because they “look” like Arabs and Muslims to Americans–the men wear turbans and the women sometimes wear a scarf on their head. They were easier targets for people seeking revenge for 9/11, which is exactly what happened. In 2001 alone, there were several reported assaults on Sikh Americans and Sikh temples, or gurdwaras. In September, a few days after the attack, Balbir Singh Sodhi the owner of a Chevron gas station was shot dead. A few months later in November, a gurdwara named Gobind Sadan, was set on fire by teenagers who misread the name to read “Go bin Laden”. Throughout the year Sikh youth reported being bullying in school and blamed for the 9/11 attacks. Many Sikh adults were harassed at work, and felt racism and hostility in their own communities. A few years later in 2004, two Sikh cousins were attacked by a mob of people. Two years after that, an elderly Sikh man was stabbed in the neck by a man who wanted to kill someone from the Taliban. 2010, two Hispanic men beat up their Sikh cab driver. It just seemed to be getting worst and worst. Last year two elderly Sikh men were shot, one dead on the scene, and one later in the hospital. This year will have been the worst attack on the Sikh community in American history with 12 worshipers killed at the gurdwara in Wisconsin. We can’t forget that there is a great amount of anti-Sikh sentiment a part from the treatment they get for being mistaken as Muslims. The majority of Sikhs come from India, and because the men wear turbans and the women tend to dress in traditional wear, they are deemed as outsiders in this country. Rajdeep Singh from the Sikh Coalition on DemocracyNow! argues that Sikhs should not be otherized the way they have been; “Ideologically speaking, Sikhs are the most Americans of Americans. We believe in religious pluralism, we believe in religious freedom, justice and equality for all.” He goes on to plead to Americans around the country to not only move toward accepting differences of other people, but also appreciating them. Much of the violence in the past recent years wouldn’t have happened to the Sikh community if Americans understood the differences between Islam and Sikhism. Much of the violence wouldn’t have occurred in the first place if Americans knew more about Islam in general. These white supremacists, and extremists wouldn’t feel the need to target any Muslim (and Sikhs who they believe are Muslims) because they would understand that not all Muslims are terrorist. If anything we’ve learned in the past few weeks, we know that not all terrorists are Muslims either. Muslims and Sikhs alike have been tormented, discriminated, harassed, and even at instances killed because of the 9/11 attacks. The Sikh and Muslim community have been forced to work together against the hate crimes, which is what I witnessed last November at an Islamophobia panel where members of the Sikh community joined members of the Muslim Public Affairs Council to discuss hate and ignorance post 9/11. 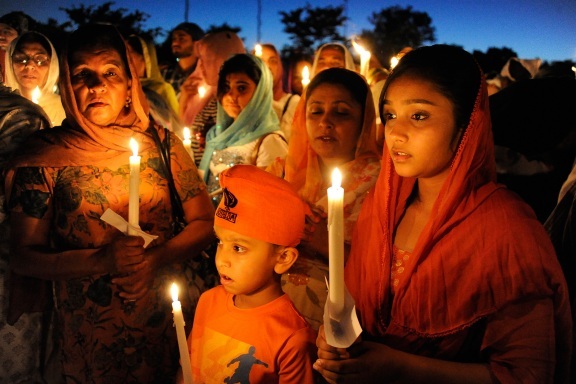 After witnessing the horrible tragedy in Wisconsin last week, we Americans can learn an important lesson from the Sikh community. Instead of stopping short at raising awareness about just Sikhism, and why targeting Sikhs is wrong, the Sikh community has taken it a step further. They’re launching campaigns to stop hate everywhere in any shape or form. If it’s anything the Sikh community has learned being victims of hate and ignorance in America, it’s that the hate won’t stop if you just give it time. It’s been eleven years after 9/11, but perhaps now is as good as time as ever to confront it. And they won’t be able to do that alone, or with just the Muslim community’s help. All ethnic and religious groups who have felt hate because of ignorance in one way or another in this country need to pull together their resources, effort and time to confront this. If it isn’t Muslims or Sikhs being targeted, in the future it’ll be another group of people. Indeed, working together is the only way we’ll truly bring long-lasting change to this country so that another massacre will never happen again.